And the flowers hold their perfection sometimes through the end of June. I cut off the shabby, previous year’s foliage in April, in order to showcase the flowers, and also to give the new foliage, which stays green through winter, space to expand. I wish I knew the varietal names of my hellebores. Alas, all of them came to me from the gardens of others. You see, I never look a gift-hellebore in the mouth. We are told that hellebores hate to be moved, and will refuse to flower for three years after transplanting. This isn’t gospel. Plants I received last year from my neighbor are now blooming their heart out in my Woodland Garden. So go figure. Culture: Hellebores perform best not in dense shade, as is commonly thought, but in the light, open shade of deciduous trees. They seem to appreciate all the winter sun they can get. Plant a group of hellebores under an apple tree, and they will delight you forever. Set the plants out in spring or in late August or September. In zone 4 hellebores should be planted as early in fall as you can get them, so that they can have time to form new roots before the first frost arrives. Let the roots stretch down, not out. I prepare a 12-inch-deep hole for each plant, spacing the plants about a foot apart, and setting the crowns just below the soil surface. Good drainage is essential; the fleshy roots will not survive wetness. 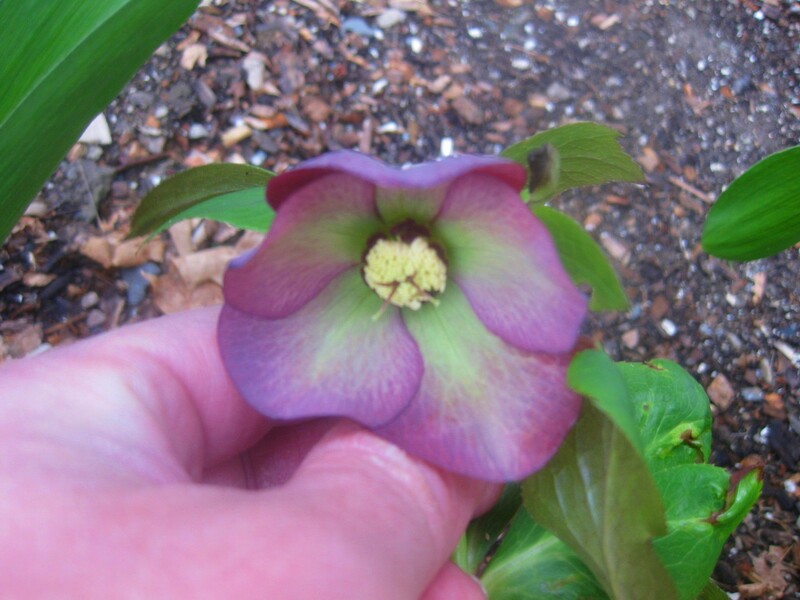 As for pests and diseases, hellebores don’t get them. And deer leave them alone. I can vouch for this, because deer frequently visit my Woodland Garden. Slugs visit there, too, but they don’t go near the plants. I can tell you that hellebores, if properly planted and located, are easy plants. Give them a top-dressing of finished compost in early spring and again in early fall. They need no encouragement from chemical fertilizers. 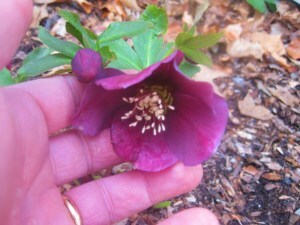 Do you have hellebores in your garden? How early do they bloom for you? Kevin, I have a huge hellebore “hedge” in the back of my house. They are greenish-white, and similar to the one in your second photo. AFter reading your post, I went out and cleaned off all the old foliage. What a difference this made! Now I can see the flowers easily. Mine never bloom before the end of March. I have them in acidic soil, but a friend told me to add lime to the bed. Does this sound right? The plants seem to bloom really well. Although I like daffodils, I like hellebores even better. I have a big mix of them, including some that are so dark purple they look black. Beautiful! My neighbor underplanted his maple tree with hellebores. They are stunning right now. I'll have to buy some this spring. Thanks for the planting instructions. Adele – Your plants seem happy in the location you've given them. I wouldn't alter the soil pH. Sheila – yes, the “black” ones are dazzling. Carol – I, too, love the sight of hellebores beneath trees. Have you every had a problem with your dog trying to eat hellebores? I have read that they are toxic. I have never seen my dogs go after plants, except for grass, and think it is highly unlikely to happen (unless a beef-sprouting hybrid is developed! ), but I always worry about this, with regard to foxglove and holly too. I ordered some hellebores this spring and they are here and ready to plant. Kathleen – My dog has never tried to eat my hellebores, although she has certainly come in contact with them while sniffing out squirrels. Most dogs and cats won't bother with plants which are poisonous to them. Mary – is it fair to say that H. niger's blooms are outward-facing, not nodding? 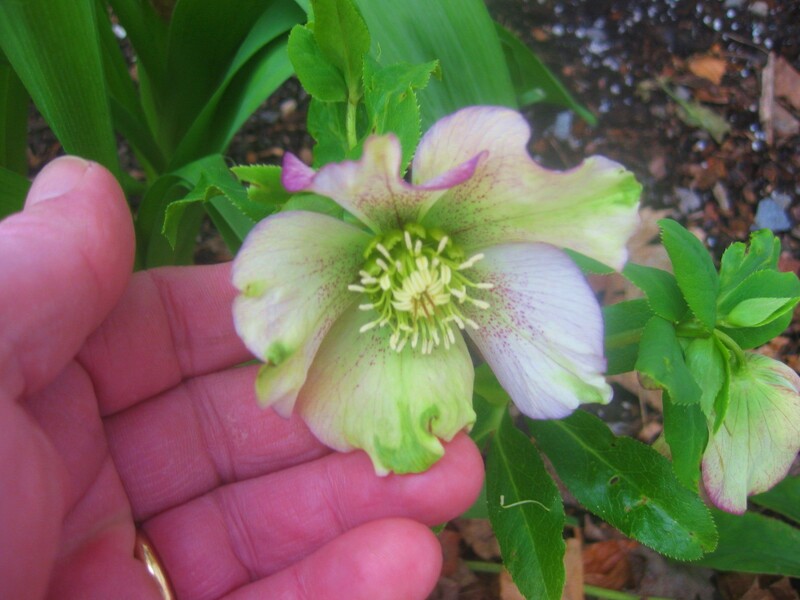 hi kevin — any trick to winter sowing hellebores? the plants are really beautiful but SUPER expensive so i wanted to try growing some from seed. any advice? Hi Lauren – At least where I live (New York’s Hudson Valley), hellebores reseed themselves freely. Thus they are terrific candidates for winter-sowing. No special tricks! i’m in chicago so i’ll give them a try! the snow looks beautiful! Mine bloomed this January here in Eastern Pennsylvania, near Bethlehem. I love hellebores! The different varieties bloom at different times of year. I have H. Niger Joseph & Jacob & they usually have buds by Thanksgiving here in southern NY. Blooms arrive sometime in December. I’m looking for space to put more hellebores in my garden.